WHEN BRAIN SURGEONS sit down with patients, the treatment would be much easier if they could simply offer replacement parts. That’s impossible to do today, but it’s not entirely wishful thinking. UC Davis neurosurgeon Ben Waldau actually has had some groundbreaking success growing parts of human brains. The latest development by Waldau and a team from the UC Davis Institute for Regenerative Cures doesn’t look like much to the untrained eye: tiny gray blobs no wider than a pencil lead, grown from a volunteer’s stem cells. What makes these organoids different is what’s inside: human blood vessels. Researchers have been able to grow brain organoids before, but without blood vessels the tissue would always die when it reached a certain size. Waldau’s team was able to show that the lab-grown organoids could grow their own human blood vessels — a process called vascularization — when they were coated in the kind of cells that form the lining of blood vessels, with the growth continuing for two weeks after an organoid was implanted in a mouse. “It’s pretty cool that we can show that it’s connecting with that tissue and surviving,” said Whitney Cary, laboratory manager and director of a team of stem cell specialists at the institute. The results, published earlier this year in the journal NeuroReport, show a possible path to even larger organoids.“Vascularizing organoids opens the door to growing larger organoids and maybe making organoids that are more similar to what we find in the human body,” said Missy Pham, a researcher at the institute and another of Waldau’s collaborators on the study. The UC Davis team couldn’t tell if the blood vessels actually contained blood because the organoids had to be cut and stained before they could be examined through a microscope, and any blood would have been washed away. But it’s still a crucial development that shows promise. “If a graft is already vascularized it may connect to the host tissue better and it may survive better,” Waldau said. This doesn’t mean that scientists will someday grow entire human brains. There would be no point even if they could because brain tissue made in a lab wouldn’t know what signals to send to the body. Waldau, though, wants to create new sections of the brain to replace damaged parts, like a motor cortex, for instance. He knows it’s a long shot, and if it works, it’ll be decades before it’s available to patients. There are many hurdles to overcome: ethical issues, safety concerns, clinical trials and more — but those tiny gray blobs could change lives. Ryan Martin wishes those replacement parts were available today. 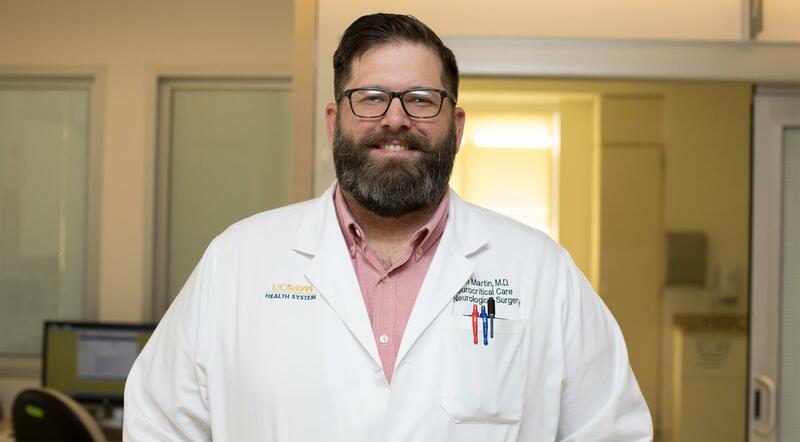 He is a UC Davis Health neurocritical care specialist who treat patients in intensive care after a stroke or traumatic brain injury. When he sees a patient, it’s often during one of the most challenging experiences of their life. When brain cells are damaged, they don’t have a way to recover. “When the brain dies, it dies,” he said. Sometimes other parts of the brain can be trained to take over some of the function that was lost, but it’s not a perfect system and often leads to an incomplete recovery. Having replacement parts could lead to full recovery, so Martin couldn’t be more interested in Waldau’s success. Even if brain organoids don’t end up in a patient’s skull, they could provide a testing model for a critical brain function that science doesn’t fully understand. For example, Lillian Cruz-Orengo wants to know why the brain sometimes fails to block out immune cells that can mistakenly attack perfectly healthy parts of the brain, leading to neurological diseases like multiple sclerosis. An assistant professor of anatomy, physiology and cell biology in the UC Davis School of Veterinary Medicine, Cruz-Orengo is working to create better models of the blood-brain barrier so she can better understand it limitations. Blood vessels in the brain are lined with special cells — the same kind Waldau’s team used to coat the organoids — that allow certain materials to pass through, but keep out pathogens and harmful drugs. Damage to the barrier, or leaks, can lead to multiple problems, like neurologic dysfunction, infection, inflammation and death. Waldau hopes the vessels in his brain organoids will develop these barriers so they function properly and can be used for the kind of life-saving medical research Cruz-Orengo conducts. For now, Cruz-Orengo is able — with some difficulty — to trick cells derived from a human blood-brain barrier to retain their specific properties in a petri dish. But, as with the recovery of brain-injured patients, there’s no substitute for the real thing.